Here's a card I made a while ago for a call that wasn't picked up. I still just love this card. It probably has something to do with the CUTE kitten patch that's on it. The paper is from American Crafts and the patch is from the same line. I know it's not any where near Halloween but it's too cute not to share. 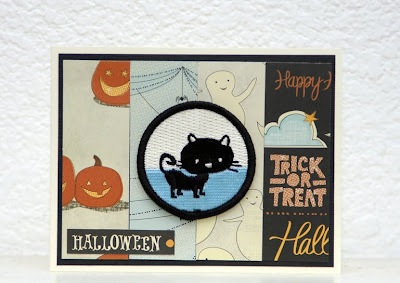 This IS a cute Halloween card! Love the whimsical images...especially the kitten patch.